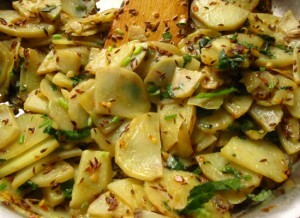 Spicy And Easy Aloo Ki Qatlian recipe by lifelongpk at DesiRecipes.com. A side dish that made in minutes and full of flavors. 2-3 med potatoes peeled and cut into thin transverse slices. 1 tea sp crushed red pepper. 1 tea sp zeera or cumin seeds . Green corriander ot hara dhanya for garnishing. Put the oil in a pan on medium flame till hot. When zeera starts spluttring and then add potato slices. Add red chilly and salt and mix it well. Cover it and leave for 10-15 minutes. Tasty Aloo ki Qatlian are ready. Garnish with hara dhanya or green corriander and serve hot.